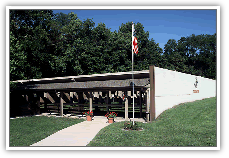 The Winchester Handgun Facility is open to the public and offers three types of programs. The Industrial Centerfire League conducted May through the end of August is separated by the level of ability and is open to teams from area organizations, businesses and law enforcement agencies. Beginner Handgun Training is a class designed for individuals to learn basic shooting skills, proper handling, cleaning and storage of handguns in the home. The training consists of two - 2 1/2 hour sessions with classroom time along with actual use of handguns. Keep all firearms unloaded unless on the firing line. Keep action open and magazine removed unless on the firing line. Always keep muzzle pointed in a safe direction-down range and away from others. All other rules of the Olin Handgun Facility must be complied with at all times. All ammunition must be purchased at the facility.